The piercing alarm went off at 5am on a Monday morning – we had to be on film location at 6am sharp. Who said that making TV adverts was glamorous? 60 minutes and a generous cup of coffee later, we were gathered in the square outside the architectural masterpiece that is the Cologne Cathedral. This was our first film location for the new Riviera Travel television advertisement, featuring our luxury river cruises. Also assembled were the cast and crew, including Angelique, who was astonishingly animated for such an early hour, but as a real-life tour guide, it’s an essential quality. 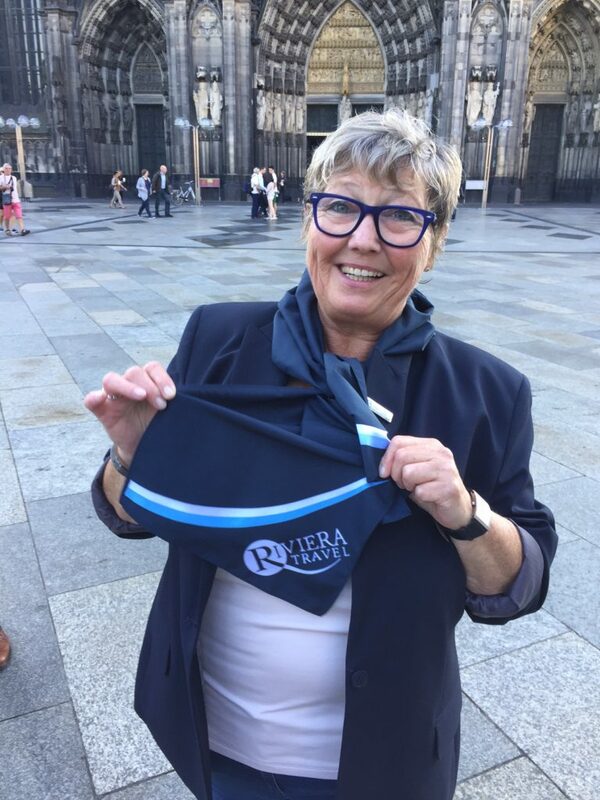 Authenticity is a key ingredient of the Riviera Travel experience, which is why Angelique isn’t an actress hired to play a role – she is an actual tour guide who knows all of Cologne’s best-kept secrets that lie off the beaten track. Before long we were off to the next location, a local bakery, where the owner, Frau Ritter, had local speciality biscuits freshly made, especially for us. It was here that we met charming Sophia, another real-life character and the hotel manager on the MS Jane Austen, the Riviera Travel luxury river cruise ship that features in the TV ad. Sophia knew this little bakery well, as she frequents it to buy pastries and local breads that are then served on the ship. Sourcing and using local produce is an important aspect of the Riviera Travel experience. After all, how can you fully enjoy a destination if you don’t get to savour the local cuisine, right? We’re pleased to confirm that Frau Ritter’s biscuits were delightfully delicious. Next we moved on to the MS Jane Austen. It was vital that our five-star river cruiser looked its best, which was not too difficult because the vessel is simply stunning and the weather was on our side! To make sure we did it justice, plenty of thought went into setting up each shot – we had to find just the right angle and the right lighting. 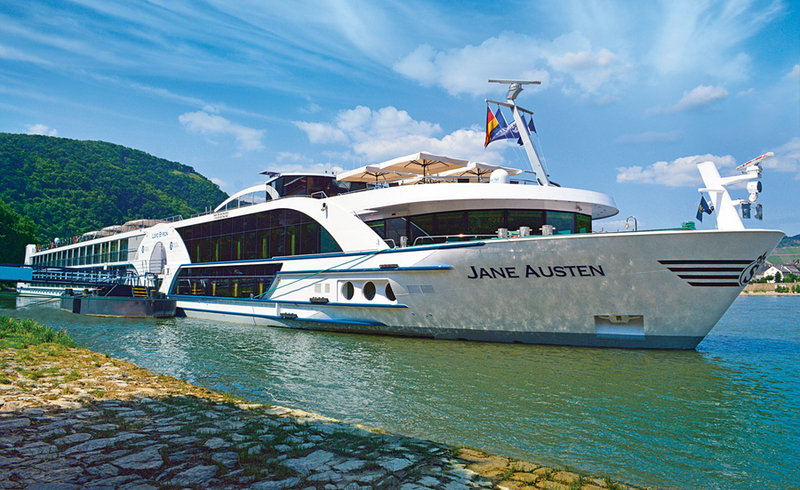 For most of the film crew, it was the first time that they’d been on a river cruise ship, and they were surprised at just how spacious the MS Jane Austen is. It was just as well, really, with our crew, the cast, and all our equipment – lights, cameras, cables, and boxes of who-knows-what. Our cast were then dressed for dinner, as the next shot captured them enjoying a sumptuous four-course dinner at the Captain’s Table. Everyone really looked like they were enjoying themselves, and why wouldn’t they – that was real wine in those glasses! The last shot of the day saw our cast on the upper deck, enjoying the sunshine we’d been blessed with. After 12 productive hours of inspired film-making, it was just after 7pm, and as they say, it was “a wrap”. We caught the late flight back to London, where the day’s worth of fantastic footage was condensed into 30 seconds, a true feat in itself. Then came the voiceover and sound mix, and our final cut was all ready to go on air on the 4th of September, 2016. You can view the final edit here. The bar is called Bar Las Teresas, it can be found at Calle Santa Teresa 2, Sevilla. The area it is in is fantastic for tapas bars and bar culture and has some of the most authentic bars in Seville. If you’re in the area try Bodega Santa Cruz (known locally as Las Columnas due to the stone columns outside it) or La Goleta just along the street ..
Seville itself is an amazing place to visit with the Plaza de Espana, La Giralda, Torre de Oro, riverboat trips, the Metropol Parasol building (said to be the largest wooden construction in the world!) to name just a few attractions ..
What music is on the advert? Hi, in the recent advert you talk about sampling the local delicacies whilst a man is tasting wine sat at a bar. Could you tell me which region this is in and do you travel to this location as I would love to visit that exact location? The bar is called Rinconcillo and is located a few minutes walk from the Don Paco Hotel in Seville. All of the locations featured in the advert are part of our Classical Spain tour. Can you take a folded Wheelchair in your room on the river cruises .? Thank you for your comment. You are welcome to store a foldable wheelchair in your cabin on any of our river cruise ships, however it cannot be used on board. Please call us when you can to discuss the details of mobility with you. Our phone number is 01293 742 300, and our lines are open 9am-7pm Monday to Friday and 10am-4pm at the weekend. May I please ask….do your ships on the river cruises, cater for disabled people please.? I have MS and rely on a wheelchair for moving around. Wheelchairs can’t be used on board but we recommend giving us a call and we can go through everything in detail with you. Our phone number is 01293 742 300, and our lines are open 9am-7pm Monday to Friday and 9am-4pm at the weekend. Having done the Rhine on MV Lord Byron in 2015 and the Blue Danube on MV Charles Dickens in 2016 we can confirm that that video was accurate in every respect. Smoking is only permitted onboard on the outside decks. Hello Riviera. I saw your TV ad today whilst I was watching Grand Designs. It made me want to try a river cruise so I’ve come to your website to find out more! It’s to see the real people behind a company, that seems so rare these days. I will request a brochure and hope to go on one of your river cruises soon! Hi Helen. Grand Designs is a great show. Thanks for your interest in Riviera Travel. We look forward to welcoming you on a river cruise in the future!